By Todd Abelson NMLS #180858 on October 30, 2014 . Can you still do a short-term house flip using federally insured, low-down-payment mortgage money? That’s an important question for buyers, sellers, investors and realty agents who have taken part in a nationwide wave of renovations and quick resales using Federal Housing Administration-backed loans during the past four years. The answer is yes: You can still flip and finance short term. But get your rehabs done soon. The federal agency whose policy change in 2010 made tens of thousands of quick flips possible — and helped large numbers of first-time and minority buyers with moderate incomes acquire a home — is about to shut the program down, officials at FHA confirmed to me last week. In an effort to stimulate repairs and sales in neighborhoods hard hit by the mortgage crisis and recession, the agency waived its standard prohibition against financing short-term house flips. Before the policy change, if you were an investor or property rehab specialist, you had to own a house for at least 90 days before reselling — flipping — it to a new buyer at a higher price using FHA financing. Under the waiver of the rule, you could buy a house, fix it up and resell it as quickly as possible to a purchaser using an FHA mortgage — provided you followed guidelines designed to protect consumers from being ripped off with hyperinflated prices and shoddy construction. Since then, according to FHA estimates, approximately 102,000 homes have been renovated and resold using the waiver. The reason for the upcoming termination: The program has done its job, stimulated billions of dollars’ worth of investments, stabilized prices and provided homes for families who were often newcomers to ownership. By Todd Abelson NMLS #180858 on August 21, 2013 . “In a move designed to more fairly treat borrowers whose credit reports contain collections actions and disputed debt accounts, the Federal Housing Administration (FHA) has eased previous rules that would have led to large numbers of application rejections. The agency also released guidance to lenders instructing them on how to handle “extenuating circumstances” claimed by borrowers who experienced serious economic setbacks triggered by the recession, but who are now employed, paying their bills and seeking FHA financing. On Friday (8/16/2013), FHA issued two mortgagee letters spelling out its new approach to widespread credit issues affecting applicants for its low down payment loans. The guidance on collections and disputed accounts (ML 2013-24) replaces controversial rules the agency first issued in early 2012. That guidance, which required payoffs of collections or disputed accounts totaling an aggregate $1,000 or more before applicants could go to closing on an FHA loan, triggered intense criticism from lenders and community groups. Critics of the rescinded rules pointed out that many consumers have disputed accounts on their credit reports that were not caused by the consumers themselves, or where they had legitimate reasons for not paying the account in full. For example, medical bills frequently lead to disputes when bills charged for services performed exceed what was estimated upfront. Also, said critics, many disputed accounts — especially medical bills that are charged off and sold to collection agencies — end up as festering negative items on credit reports, even when the consumer had legitimate reasons for disputing the charges. In its latest guidance, FHA appears to deliver on its promise of a more ‘balanced yet flexible’ set of standards. The new disputed account rules, which take effect Oct. 15, exclude consideration of all medical collection and charge-off accounts, and “do not require resolution” for applications to move forward. The new rule requires that lenders document the reasons for approving a loan when the borrower has collection accounts in any amount. But if the total exceeds $2,000, the lender must undertake a “capacity analysis” designed to determine whether the borrower can handle any periodic payments that may be required to retire the debt. Among the possible outcomes of a capacity analysis: The applicant might pay off the collection account, or make payment arrangements with the creditor. Generally, whatever scheduled payments are due under the arrangement must be reflected in the applicant’s debt-to-income ratio calculations. Unlike the earlier, now-rescinded guidance, the new rule treats derogatory disputed accounts separately. If the aggregate amount of disputed items on the credit report is equal to or exceeds $1,000, the lender must now manually underwrite the application. If the total balances are less than $1,000, manual underwriting — which takes more time — is not required. Disputed medical accounts are excluded from the $1,000 limit and no documentation will be required. The same exclusion applies to disputed accounts where the problem was created by identity theft, credit card theft or unauthorized use. Court-ordered judgments against borrowers that show up in their credit files are treated differently: They’ve got to be paid off in full or there must be a written agreement detailing “regular and timely” payments to retire the debt, and documentation that at least three payments already have been made. A second set of lender guidance (ML 2013-26) published last Friday essentially spells out FHA’s approach to “extenuating circumstances” that may have triggered steep drops in applicants’ credit scores. Far more so than conventional market investors or insurers, FHA historically has been more willing to consider the contributing factors that make credit-impaired applicants look more risky than they really are. Extenuating circumstances are important to FHA in evaluating whether a borrower who experienced a foreclosure, short sale, deed-in-lieu, bankruptcy or other event in the past but is now employed and paying credit accounts on time should be considered eligible for a new FHA-insured loan. The new guidance offers the potential of waiving FHA’s standard waiting periods from one of these events to qualifying for a new mortgage. FHA – like death and taxes, FHA MONTHLY MI is now FOREVER! By Todd Abelson NMLS #180858 on May 31, 2013 . Currently, Monthly MI is dropped automatically when the loan amount reaches 78% of the original purchase price of the house… which typically takes 10 years if making a 3 1/2% down payment on a 30-year loan (most typical usage). There are currently also provisions for reduced or NO Monthly MI if you’re making a 5% (or more) down payment and/or using a 15-year loan (less prevalent, but it does occur). Removing the exemption of MIP for loans with a term of less than or equal to 15 years and an LTV less than or equal to 78% at origination. The Home Equity Conversion Mortgage (HECM) program. To read the actual verbiage, click to view ML 2013-0 for more details concerning this policy. Call Todd Abelson at Sunstreet Mortgage (520) 331-LEND (5363) for all your mortgage needs! Reduced FHA loan limits in Arizona as of October 1, 2011? By Todd Abelson NMLS #180858 on August 16, 2011 . Unless subsequent regulation is passed to further extend the temporary loan limits, the temporary high balance loan limits defined by the American Recovery and Reinvestment Act of 2009 (ARRA) will expire on September 30, 2011. This is generally being viewed as going by the NOTE DATE – loans with a NOTE DATE on or after 10/1/11 must use the lower limits. Each investor may make different rules that may require an earlier funding or lock date or a final delivery date. Please be advised that any applications for a loan amount between $271,050 and $316,250 (in Pima County) will need to lock, close and fund BEFORE 9/30/11 to be safe. This is not based on CASE NUMBER ASSIGNMENT DATE! To further complicate matters the current floor of $271,050 may go down at the end of the year. BTW – The $271,050 is based on 65% of the Conforming loan limit from before 2009. This year the conforming loan amount is subject to change and just like every year before 2008 will go up or down based the median home price in the US. If I was to bet on this I would have to say they will likely go down. The conforming limit of $417,000 may be extended further but no one knows. By Todd Abelson NMLS #180858 on April 19, 2011 . Effective Monday April 18th, the monthly Mortgage Insurance premiums FOR ALL FHA LOANS regardless of down payment have increased. As example, for a $150,000 30-year loan with minimum down payment the increase equates to about $31 per month. Below is the new chart for reference – note that it’s a flat 25bps per month across the board. Regardless, FHA is still the best opportunity for the average home buyer to purchase a home given today’s market. By Todd Abelson NMLS #180858 on November 23, 2010 . On January 15, 2010, HUD issued Waiver of Requirements of FHA regulations 24 CFR 203.37a(b)(2), allowing a one year waiver to its flip policy on transactions where the property seller is owner-of-record 90 days or less. In that Waiver, HUD provided additional requirements for FHA flip transactions where the sale price of the subject property has increased by 20 percent or more above the seller’s original acquisition cost. In preparing for the end of this waiver period, Investors have just CEASED buying loans that require this waiver. In otherwords we’re back to the original rules prior to the waiver – If the current owner of record has been on title for less than 90 days, the following exemptions still apply. If you are a Buyer (or a Realtor working with a Buyer) purchasing a home under the terms of this waiver, contact your lender NOW for an update. Call Todd Abelson & Tyler Ford at Sunstreet Mortgage at (520) 331-LEND for all your mortgage needs! NEW FHA Mortgage Insurance effective October 4th! By Todd Abelson NMLS #180858 on September 29, 2010 . As a result of new Public Law 111-229, FHA was given authority to change the amount charged to borrowers for both the Up-Front and the Annual Mortgage Insurance premiums. These changes as outlined in Mortgagee Letter 2010-28, are effective for all case numbers assigned on or after October 4th, 2010. These NEW premiums apply to purchases, regular refinances and streamlines. The result will be HIGHER monthly mortgage payments on new loans, although Borrowers will maintain a bit more equity. Just what we needed, right? HIGHER mortgage payments!!! If you are in the process of locking in an FHA loan, I suggest you get your FHA case # assigned THIS WEEK to beat the new fees! Call Todd Abelson & Tyler Ford at Sunstreet Mortgage in Tucson, AZ at (520) 331-LEND for all your mortgage needs! FHA Mortgage Insurance to change FOR THE WORSE? By Todd Abelson NMLS #180858 on August 6, 2010 . In an unbelievably native attempt to prop up the FHA Mutual Mortgage Insurance Fund, effective September 7, 2010 the Up Front Mortgage Insurance Premium (UFMIP) is decreasing from 2.25% to 1.00% and the Monthly Mortgage Insurance Premium is increasing from .50%-.55% to .85%-.90%. Now I can’t begin to see things from there side, but here’s how I see it – the monthly cost of owning a home will increase; here’s a typical example: Assuming a $125,000 purchase price using a 30-year fixed rate FHA loan at 4.50% under the CURRENT terms (3 1/2% down, 2.25% UFMIP, .55% MMI) the Principle, Interest and MMI portion of the payment will be $680.23. Under the NEW terms (1.0% UFMIP, .90% MMI) the same home will cost $707.77 – $27.54 per month MORE (an increase of 4% in payment). While this may not be alot to most people, it may be the difference between loan approval and denial. Besides what does this do to help people BUY homes and “mop up” the excessive inventory? PLUS if less people can afford to purchase a home doesn’t that mean LESS moneywill go to into the FHA Mortgage Insurance Fund which defeats the whole purpose? This move is akin to raising taxes to help the economy. It doesn’t a genius to see that it doesn’t work in business world and so it probably won’t work in Real Estate world either. By Todd Abelson NMLS #180858 on March 30, 2010 . 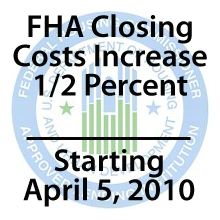 Starting Monday, April 5, 2010, getting an FHA mortgage in Tucson and nationwide will be more expensive for borrowers. In new guidelines set forth earlier this year, the FHA announced plans to raise additional revenue and reduce the overall risk of its mortgage portfolio. For your own loan, to avoid being subject to higher loan costs, make sure to have your FHA Case Number assigned prior to Monday, April 5, 2010. That means you’ll want to give a full mortgage application before the weekend so your lender can register your loan in time for the deadline. But don’t leave your application to the last minute. Friday is Good Friday so most banks will be closed. Your true FHA deadline, therefore, is Thursday April 1. 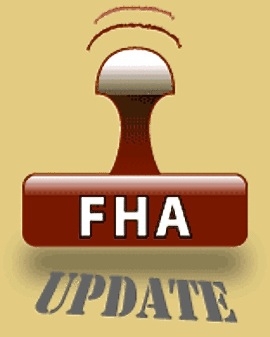 Also worth noting is that the FHA isn’t done with its changes. For now, the request is neither approved nor acknowledged by Congress. It’s merely a request. And in the event that Congress does approves it, the FHA reserves the right to change its projections. Either way, it means higher costs for consumers. The best plan, therefore, is to get your FHA mortgage into underwriting ahead of the switches because borrowing money will be harder, and more costly. Increase to FHA upfront mortgage insurance on April 5th! By Todd Abelson NMLS #180858 on March 24, 2010 . Homebuyers and Homeowners are reminded that effective on FHA loans for which the FHA case number is assigned on or after April 5, 2010, FHA will collect an upfront mortgage insurance premium of 2.25 percent. This policy change will increase premiums for purchase money (now 1.75%) and refinance transactions (now 1.50%) including FHA-to-FHA credit-qualifying and non-credit qualifying streamlined refinance transactions. Please make every effort to get your contracts ratified or your refinance in process early in the week of March 29, 2010, since it is possible that FHA case numbers requested on Friday or Saturday may not be assigned prior to April 5, 2010, and therefore, be subject to the higher premium. Call Todd Abelson and Tyler Ford at Sunstreet Mortgage for all your mortgage needs! (520)-331-LEND.